Opinion polls and Exit poll projections are exciting, to say the least! Worldwide odds are possibly in favor of Hilary Clinton as the next US President right now, but who knows? In three more months public opinion may swing in favor of Donald Trump! But you will never know who will win till the last vote is cast. How is it then that exit poll predictions too show such volatility? I am sure most of us following the Bihar Election results spent the morning surfing one news channel after another and finding very different exit poll projections. One wondered whether they are talking about the same election or not. Exit polls are conducted as voters come out of the polling booths and are asked who they have voted for. The main difference between exit polls and opinion polls is that, in the latter voters state their preference at the given time. Exit polls are considered to have the power to swing electorate opinion. Election Commission of India banned publication of exit poll results in any form from October 12, the first phase of Bihar election till November 5, when the last of the five-phase polls has taken place. It is not the first time either, and definitely India is not the only country where exit polls are thought to have an effect on public opinion. In 1980 when Ronald Reagan was elected as American President for the first time, exit polls predicted Reagan victory based on exit polls at the conclusion of voting on the East Coast, whereas in the West Coast the election was still open due to a three-hour time difference. There is speculation that the prediction was taken as de facto result and voters did not vote any more. Also Read Is Data Science A ‘Pseudoscience’? Are Exit Polls in India accurate? Assuming that respondents answer whom they voted for truthfully, exit polls are examples of accurate analytics application in predicting complex human behavior. However the politicians, especially those at risk of losing the ballot-battle, vociferously denounce the predictions. One of the favorite argument is how in a country of 800 million voters, an exit poll based on 80 thousand be relied up on? But this is where the beauty of analytics lies. 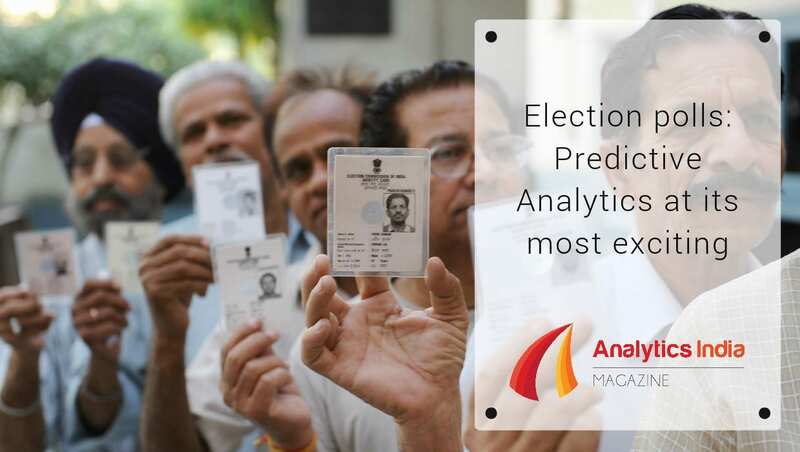 An experienced psephologist can predict outcome of an election with considerable accuracy if the collected data is a representative sample and the method of prediction, or the model, is able to consider various factors. The main objection to exit polls is that can a tiny fraction of the whole voter population be used to accurately predict the outcome. The answer is a resounding YES! More than the size of the sample, it is the quality of the sample that is responsible for accurate exit polls. Today’s Chanakya used a sample of approximately 40,000 spread over 22 states and Union Territories while predicting 2014 Lok Sabha results. Hansa Research used a sample of 160,000; Nielsen used an even larger sample. Other agencies like NDTV, ABP News, Times Now etc. did their own sample selection and different projections came out. In Indian politics caste, religion, anti-incumbency factors, regional interests etc. have a significant influence on the results. How do pollsters ensure accurate testing? Naturally, selection of constituencies is very important. In countries like United Kingdom, where the two large parties have committed vote banks, many seats are considered safe. So it is enough to concentrate on the remaining marginal constituencies for tracking election polls. In India, the story is completely different. Voting behavior here is largely personality-based, rather than issue-based. Voters’ mood is easily swayed and in many cases, depends on instantaneous and regional factors. Political parties keep breaking up old alliances and forming new alliances. The idea of safe seats does not hold water in India. So we can think of prediction of seats in an election for a particular party done in two stages – predicting the proportion of votes a party gets in a region and based on that, how many seats that party wins. Keep in mind that these are not identical concepts. Suppose there are only two seats and two parties in a locality. Total number of eligible voters for each seat is 100. In seat S1, party A gets 55 votes and it wins. In seat S2 party B gets 70 votes and it wins. Vote share between party A and B in that locality is 42.5% and 57.5% but seat share is 50-50! Add to that a fraction of voters not voting, a large number of parties contesting and many other factors. Psephology or election analytics is as complicated as party politics, if not more. No wonder that for 2014 Lok Sabha election Today’s Chanakya projected 340 seats for BJP-led NDA whereas NDTV projected NDA final tally to be about 280 seats. For the Bihar 2015 Vidhan Sabha election, however, Chanakya predicted 155 seats for NDA and 85 to Grand Alliance. In the former case Chanakya hit the Bull’s Eye but for Bihar they sadly missed the mark by a large margin. So what happened? Why different agencies show very different results for the same election? Does that mean that the politicians are correct in rejecting the exit polls as unscientific? The implementation of exit polls in a country like India is a mammoth task. Depending upon the resource and desired accuracy, the nationwide target sample is determined. A proportion of constituencies is determined for sampling and then from the selected constituencies a small number of polling booths are selected randomly. Then a proportion of the voters with indelible ink mark on their finger is selected randomly and asked who they have voted for. To determine the number of seats won by each party in a state or in India, complex analytical models need to be followed. When Chanakya gave a complete opposite forecast for Bihar election they claimed that in their template the two contestants were switched! In case of alliances, the model accepts vote for a party as an input and then the party is linked to the alliance. The model should be able to handle all political, psychological and behavioral factors to determine the final winners. A controversial topic is whether to go for a quota sampling or not, where population is divided into various demographic and socio-economic categories and a representative sample is taken across the groups to ensure accuracy. It’s unfortunate that many poll survey results, even by reputed analysts, are not supported with the sample size, sampling method, confidence level, and the margin of error. I am not sure why these companies used such a very large sample size (40,000 to 160,000) and how they ensured randomness is anyone’s guess. It would be better if the analysts or researchers supply these meta-data of such public surveys conducted to enhance the trustworthiness among the public of such socially important reports.